https://www.tradingdepot.co.uk/deanta-seville-white-primed-glazed-1l-fire-door-1981x762x45mm-wood-white-primed-45sevcgf-dwhp762 80470 Deanta Seville White Primed Glazed 1L Fire Door 1981x762x45mm - Wood: White Primed - 45SEVCGF/DWHP762 https://www.tradingdepot.co.uk/media/catalog/product/4/5/45sevcgfdwhp762.jpg 387.39 387.3900 GBP InStock /Building/Doors /Brands/Deanta /Brands/Deanta/Complete Deanta Collection /Brands/Deanta/Seville The 45SEVCGF/DWHP762 is just a small part of the Deanta door range available at Trading Depot. 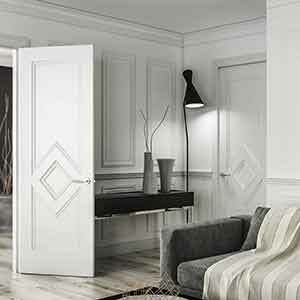 The Seville Interior Prefinished White Glazed Fire Door – made by Deanta, is a high quality, stable and beautifully finished door for any home or place of work. Because of its solid timber core, it has a ‘heavy’ feel. Made using smooth faced timber strips on the surface to ensure a smooth, clean finish. They also are supplied with a thick, 15mm solid timber lipping to make them easier to fit and retain screws and hardware much better than other door styles. Also available in Walnut, Oak. Supplied with thick, clear fire rated glass fire safe as a 30 minute fire door.